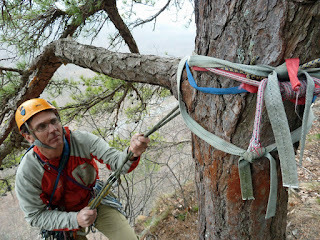 Bigfoot Mountain Guides: How Good is that Anchor? How Good is that Anchor? For many years climbers in the Gunks would top out on their route and walk off from the top of the cliff. You had to come back to the Uberfall between routes. This descent method is still a really good choice if you're climbing near the Uberfall. Walking off is almost always safer than any technical method of descent. As you get further from the Uberfall (or Radcliffe or the Escape Hatch) though, walking off becomes time consuming. 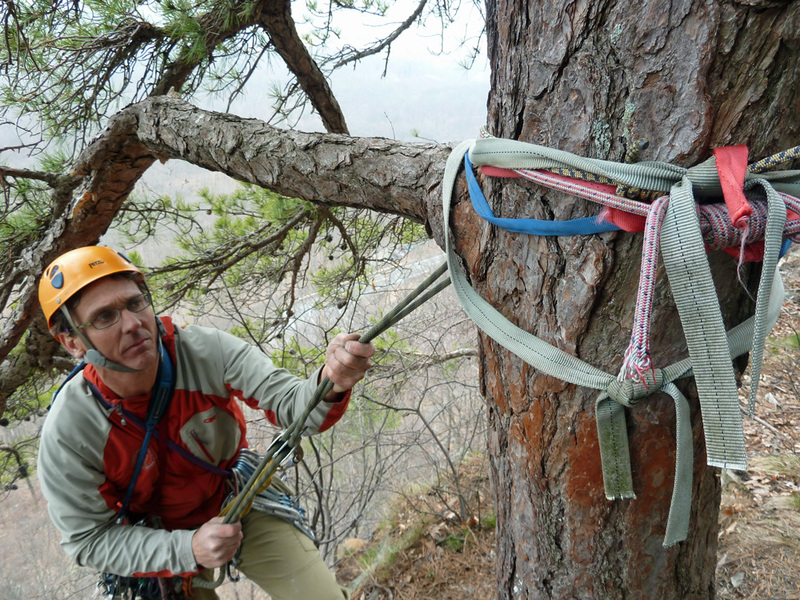 Most climbers nowadays opt to rappel back to their packs at the base of their chosen route. Let's face it, rappelling is dangerous. In fact, it's the part of the whole climbing process that scares me the most. There is an almost inexhaustible list of bad things that can happen during a technical descent so I won't discuss them here. I spend a lot of time on ledges in the Trapps and I see lots of rappel anchors. Most guides I know spend time reconfiguring junk anchors left by unsuspecting parties. Most of the very popular trade routes now have bolted belay/rappel anchors which I think is the way to go. However, there are still a lot of tree anchors of varying quality. 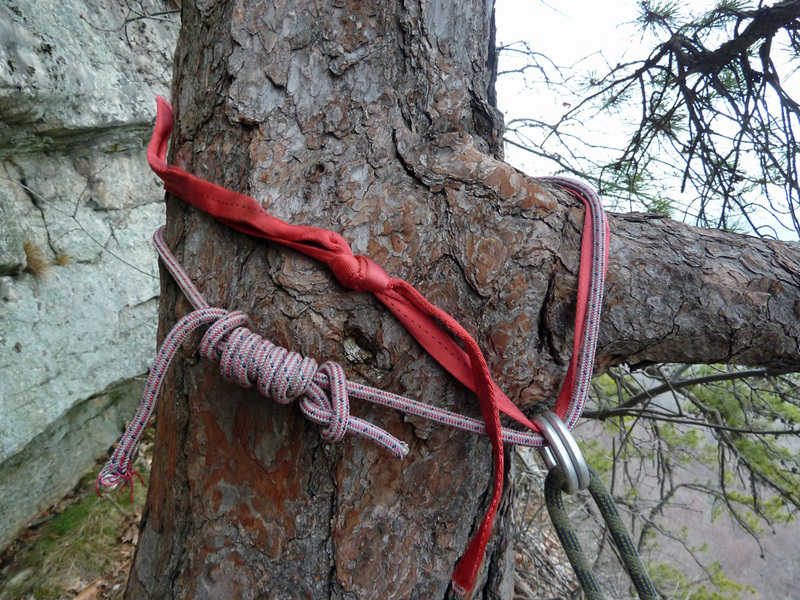 Twice this season I've found tree rappel anchors with 6 slings on them. I've only been out guiding in the Trapps twice so I'm batting 100% right now. When you find an anchor with 6 slings on it what do you think? My guess is that most people think "Oh, there are a lot of slings there so one of them must be good", or "all 6 combined are strong enough". 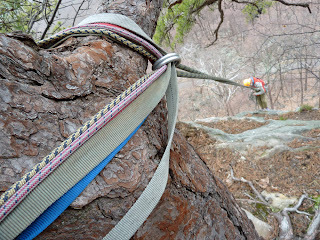 The truth is that with 6 slings on a single tree it's hard to evaluate the integrity of any of the slings. That means 6 knots and 6 pieces of cord/webbing to inspect. As a guide I'm always teaching people to ask the question "why" before committing to an action. If you don't have a good reason why you're doing something as a climber, well you probably shouldn't be doing it. So, assuming the tree/gear anchor is good, let's break down the "why" for 6 slings. Question: How much load does that rappel anchor bear at any given moment? Answer: Even if you hang 3 people off of that anchor at once the maximum load that anchor will bear is probably 750-1000lbs. Remember, this isn't an anchor that will experience big spikes in load, all you do is lean back and slide down the rope. One single piece of webbing or cord will easily bear that load. Should we only leave one piece of cord at that anchor then? We could add a second piece of cord to share the load and provide some peace of mind. This principle of redundancy is frequently employed in climbing and ensures that should one anchor fail we have a back-up in place. Two good, well-tied slings of even length with two aluminum rappel rings is an awesome inexpensive and simple anchor. It's strong enough to hold any load your could apply in a climbing scenario. It's also simple to visually inspect. The next time you find an anchor with 6 ratty slings on it do everyone a favor and cut away the junk so that there are 2 really good slings that everyone can feel good about.